This Simple But Elegant Cast Iron Sizzling Plate is your best buddy to cook personal sized meats or vegetables. Cook with the sizzling plate on your stove then remove and put on the wooden base for serving. 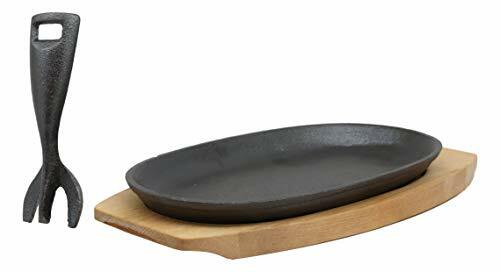 This Simple But Elegant Cast Iron Sizzling Plate serves 1 person in general and measures 9.5" long, 5.5" wide and 0.75" tall approximately. The set weighs about 2.75 pounds. The Wooden base is 11.5" long, 5.75" wide and 0.5" tall. The cast iron handle is 5" long.